Thirty-five years in the making, electronic paper is now closer than ever to changing the way we read, write, and study — a revolution so profound that some see it as second only to the invention of the printing press in the 15th century. Made of flexible material, requiring ultra-low power consumption, cheap to manufacture, and—most important—easy and convenient to read, e-papers of the future are just around the corner, with the promise to hold libraries on a chip and replace most printed newspapers before the end of the next decade. This article will cover the history, technology, and future of what will be the second paper revolution. In the 1970s, Xerox Palo Alto Research Center (Xerox PARC) was a powerhouse of innovation. Many aspects the modern computer, namely the mouse, laser printer, Ethernet, GUI, computer-generated color graphics, as well as a number of important computer languages, were invented at PARC around that time. Yet another development, nearly lost among those important breakthroughs, was invented in 1974 by PARC employee Nicholas K. Sheridon. The Gyricon, a Greek term for rotating image, was to be new display technology for the Alto personal computer; eventually, it became the basis for modern e-paper technology. Nearly 35 years later, TFOT sat down with Nick Sheridon to ask him about his historic invention. A: In the late 60s and early 70s, Xerox PARC was developing and attempting to get Xerox management to appreciate the Alto personal computer; they never did. It was the world’s first office and word-processing computer, but this remarkable machine had one serious drawback: the cathode-ray tube display it used—the best available—was not bright enough, and the contrast was not great. People that used the machine did so in a darkened room, with the lights turned off and the window shades drawn. Several of us scientists were asked to try to find a better display, hopefully one that could permit operation in a brightly lit ambient. I invented the Gyricon rotating-ball display and a display based on a physical phenomenon I called “electrocapillarity.” The electrocapillarity display worked by moving colored liquids against a white background. The rest of the group worked on electrophoretic displays (eventually dropped due to lifetime problems). I codeveloped the Gyricon and electrocapillarity displays for about 18 months and finally decided the Gyricon would be easier to develop. Hoping to get back to the electrocapillary display, I delayed applying for patents until the early 90s. When my patent applications were laid open in Europe, a university group revived the work and changed the name to “electrowetting.” Electrowetting is widely studied and is considered a promising candidate for electronic paper. I published a paper on the Gyricon and made several presentations. Several patents were applied for. About this time, I met the Xerox head of corporate research in the PARC cafeteria. He complimented me on my display work but pointed out that Xerox was not in the display business. At this point, I realized the Alto was not going to be developed by Xerox. He strongly urged me to invent new printer technology to counter the erosion of the Xerox copier/printer market by the Japanese. I stopped the Gyricon work and eventually invented a new electronic-printing technology based on ionography. This became a large program at Xerox, consuming perhaps $150 million; this number is hard to establish. We developed and were in early-manufacturing operations of the world’s first multifunction desktop machine—printer, copier, input scanner, and fax—when this program was cancelled. This left me free to invent the concept of electronic paper. Much has been written about the incredible myopia of Xerox executives of the time, so I won’t go into that except to say that there were numerous other opportunities to enormously expand Xerox’s business that were similarly fumbled. Xerox had enough money to create an incredible research lab with top-notch people, but Xerox management could not shake off the copier mentality. Q: So how was e-paper born? A: I realized the need for e-paper in 1989. At Xerox PARC, we had long predicted the advent of the paperless office, with the widespread adoption of the personal computer we pioneered. The paperless office never happened. Instead, the personal computer caused more paper to be consumed. I realized that most of the paper consumption was caused by a difference in comfort level between reading documents on paper and reading them on the CRT screen. Any document over a half page in length was likely to be printed, subsequently read, and discarded within a day. There was a need for a paper-like electronic display — e-paper! It needed to have as many paper properties as possible, because ink on paper is the “perfect display.” Subsequently, I realized that the Gyricon display, which I had invented in the early 70s, was a good candidate for use as e-paper. I set about developing a manufacturing process for the Gyricon and solving its early problems. At this time, I was working alone, with a very good technician. Q: Was there a eureka moment, or was the outcome more or less anticipated from the start? A: There was a eureka moment when the need for e-paper crystallized in my mind and I realized—or thought I did—the magnitude of the challenge. Very euphoric! Q: It’s been almost 35 years since the invention of e-paper. Why do you think it is taking so long to enter the market? A: E-paper has entered the market, but not yet in a big way. 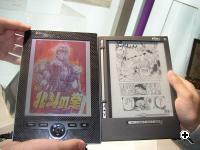 Gyricon sold message signs, and E Ink Corporation provided the e-paper for the Sony Reader sold in Japan. Kent Displays is also selling signs. No technology is yet sufficiently paper-like to grab the huge latent market widely recognized to be there. More invention is needed. This is a lot like the early days of television development, when everyone knew what was needed but getting the technology right was tough. Q: What do you see as the obstacles facing mass adoption of e-paper technology? A: No technology is sufficiently paper-like, yet. By this, I mean a display medium that is thin, flexible, capable of storing readable images without power consumption, highly readable in ambient light, and has good resolution, high whiteness, and good contrast — and is pretty cheap. A big part of this equation is the addressing electronics. Organic thin film transistors, or TFTs, will provide flexible addressing at a low cost, and other technologies show promise, but none of these are quite ready. Q: Are these problems currently being addressed by the industry? A: More than a dozen companies have announced work on active e-paper programs, and there are a number of start-ups. As I mentioned, the low cost and flexible electronic-addressing capability of organic TFT technology is important and is being intensively developed by a number of organizations. Still, I have not yet seen the ideal e-paper media solution. Q: Are you still working on the development of e-paper? A: Xerox closed its Gyricon operation in December 2005 for financial reasons. (I was director of research. I am now working independently and doing some consulting. And, yes, I am working to invent the perfect e-paper medium. Q: When do you think we will see widespread use of e-paper? A: I think the revolution will evolve, first as handheld displays of high contrast that are readable in direct sunlight —probably in the next year or two—followed by low power-consuming book readers (available in Japan, and more widely as intellectual-property rights issues are sorted out); and over the next five years, electronic signs and billboards. The pocket document reader will take a little longer. Q: How do you see the future of e-paper? producedby 3M partners. (Credit: Xerox). A: I like to tell people that the holy grail of e-paper will be embodied as a cylindrical tube, about 1 centimeter in diameter and 15 to 20 centimeters long, that a person can comfortably carry in his or her pocket. The tube will contain a tightly rolled sheet of e-paper that can be spooled out of a slit in the tube as a flat sheet, for reading, and stored again at the touch of a button. Information will be downloaded—there will be simple user interface—from an overhead satellite, a cell phone network, or an internal memory chip. This document reader will be used for e-mail, the Internet, books downloaded from a global digital library that is currently under construction, technical manuals, newspapers (perhaps in larger format), magazines, and so forth, anywhere on the planet. It will cost less than $100, and nearly everyone will have one! 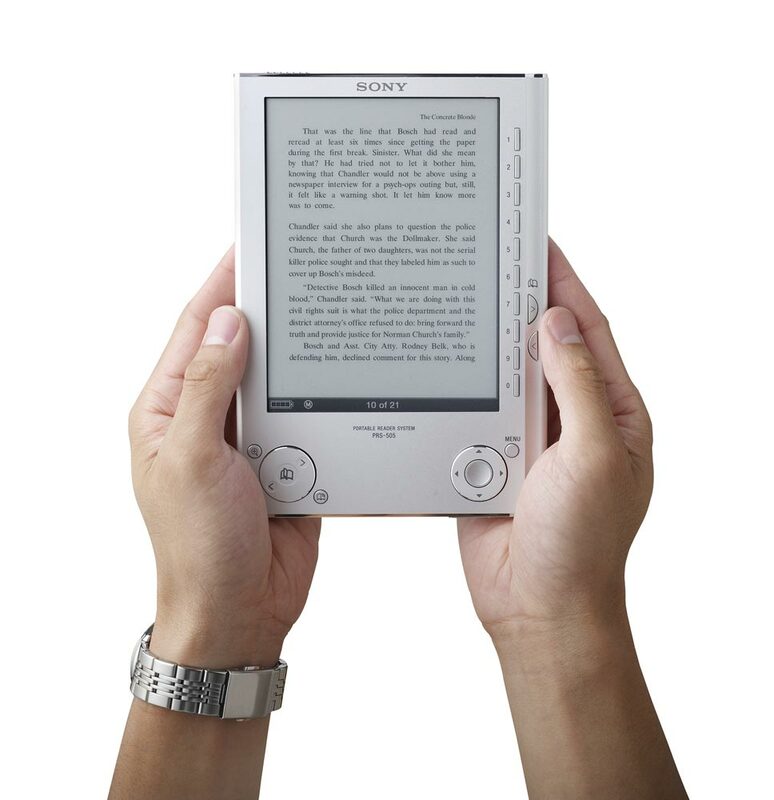 E-paper comprises two different parts: the first is electronic ink, sometimes referred to as the “frontplane”; and the second is the electronics required to generate the pattern of text and images on the e-ink page, called the “backplane” and reading them on the CRT screen. Over the years, a number of methods for creating e-ink have been developed. The Gyricon e-ink developed in the 70s by Nick Sheridon at Xerox is based on a thin sheet of flexible plastic containing a layer of tiny plastic beads, each encapsulated in a little pocket of oil and thus able to freely rotate within the plastic sheet. Each hemisphere of a bead has a different color and a different electrical charge. When an electric field is applied by the backplane, the beads rotate, creating a two-colored pattern. This method of creating e-ink was dubbed bichromal frontplane. Originally, bichromal frontplane had a number of limitations, including relatively low brightness and resolution and a lack of color. Although these issues are still being tackled, other forms of e-ink, with improved properties compared to the original Gyricon, have been developed over the years. 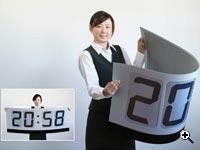 One such technology is electrophoretic frontplane, developed by the E Ink Corporation. Electrophoretic frontplane consists of millions of tiny microcapsules, each approximately 100 microns in diameter—about as wide as a human hair. Each microcapsule is filled with a clear fluid containing positively charged white particles and negatively charged black particles. When a negative electric field is applied, the white particles move to the top of the microcapsule, causing the area to appear to the viewer as a white dot, while the black particles move to the bottom of the capsule and are thus hidden from view. When a positive electric field is applied, the black particles migrate to the top and the white particles move to the bottom, generating black text or a picture. 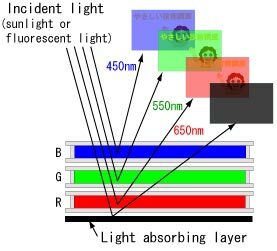 The brightness and resolution of electrophoretic-based e-ink is better than that of bichromal-based e-ink, but both are monochromatic in nature. To create color, E Ink joined hands with the Japanese company Toppan Printing, which produces color filters. Another drawback of electrophoretic e-ink is its low refresh rate, making electrophoretic e-ink unsuitable for displaying animation or video. Since it takes time for the particles to move from one side of the microcapsule to the other, drawing a new text or image is too slow and creates a flicker effect. A completely different solution for creating e-paper, known as cholesteric liquid crystal (ChLCD), is being developed by such companies as IBM and Philips, as well as HP and Fujitsu, which have demonstrated actual devices. ChLCD technology is based on the well-known and widespread technology of liquid crystal displays (LCDs), which work by applying a current to spiral-shaped liquid-crystal molecules that can change from a vertical to a horizontal position. Although other potential technologies for developing advanced color electronic paper exist such as photonic crystals (P-ink) recently covered by TFOT, many analysts believe that ChLCD technology could become the dominant e-paper technology of the next decade. This assessment relates to the high level of maturity exemplified by the current LCD industry, as well as to the fact that ChLCD technology currently offers what many analysts see as the ideal list of features for e-paper: flexibility and even bendability; thinness, at approximately 0.8 millimeters; lightness; a bi-stable nature, requiring no power to maintain an image and very little power to change it; good brightness, contrast, and resolution; as well as vivid color and a decent refresh rate capable of displaying animation and possibly even video. technology that already has been commercialized by a number of companies, including iRex Technologies and Sony, both of which already have commercial e-paper readers on the market. 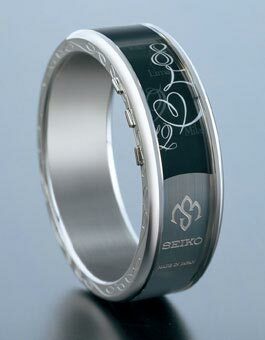 At this stage, some of the products based on E Ink’s technology are little more than expensive gimmicks, such as Seiko’s limited-edition e-paper watch (priced at over $2,000). Other products to be marketed have more substantial applications. 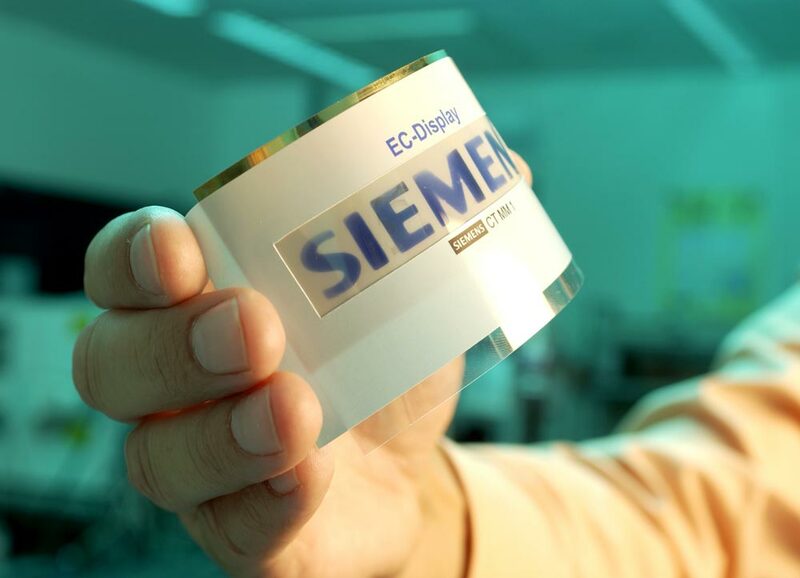 E-paper thin color displays for packaging, currently under advanced development at Siemens, could display prices on products dynamically, instantly altering a product’s price when necessary (using such low-power wireless technology as radio-frequency identification, or RFID, for example). A dynamic expiration date, which would graphically display the amount of time remaining for food and drug consumption, is another potential application. TFOT asked Till Moor from Siemens to describe Siemens’s interest in e-paper technology. 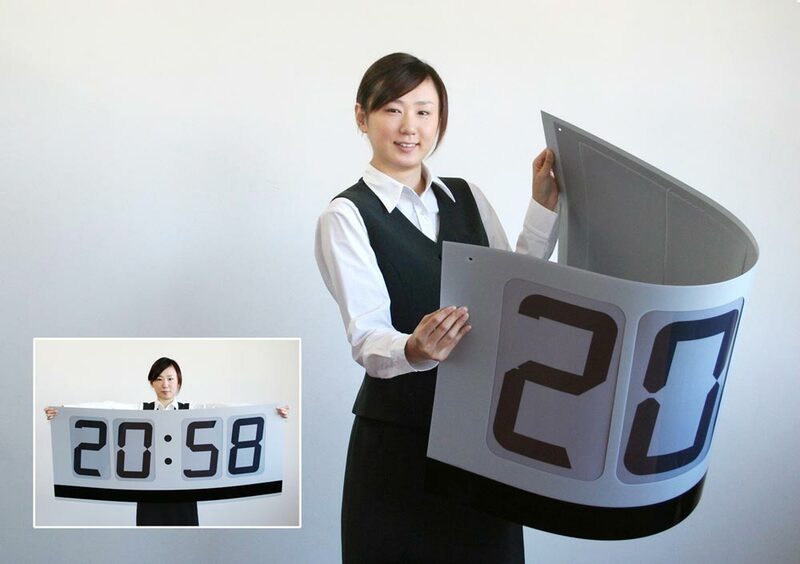 Moor: developed wafer-thin color displays that can be printed onto paper or foil. They can be manufactured very inexpensively, compared to LCDs. Wafer-thin displays offer great market potential in the area of future advertising and information provision by means of interactive packaging. Displays could provide selective information about a product or operating instructions for a device directly on its packaging. A drug box could, for example, display administration instructions that appear in several languages at the press of a button. Color displays could in the future display information practically everywhere—on cardboard foodstuff containers, drug boxes, or even admission tickets. Potential applications of e-paper technology is staggering. In addition to a new method for labeling foods and drugs, it could be used to label anything from shelves to office binders. One of the original uses of the Gyricon e-ink was in advertising and billboards; the bi-stable nature of the technology made the Gyricon a useful and cost-effective billboard technology. E-paper displays can also be used as low-power digital screens for a variety of electronic appliances, from microwaves to MP3 players. Although many potential applications for e-paper technology exist, one of the more exciting products is the e-paper reader, which may soon replace the age-old newspaper and possibly even certain types of books; some technical literature may be perfectly suited for e-paper. The next generation of e-paper readers will add color, include improved hardware that can refresh pages more quickly, and have more advanced wireless capabilities. Existing readers from Sony, iRex, and a number of other companies are still quite expensive and suffer from some of the problems that plague early technology models. 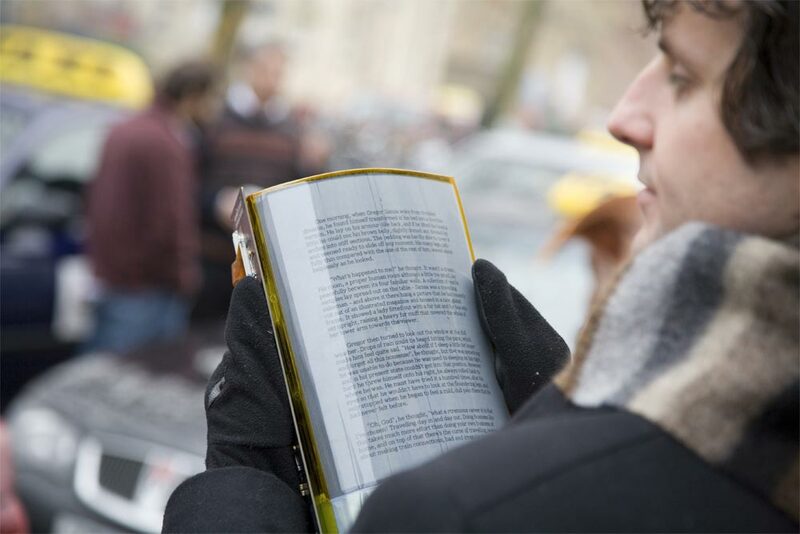 The next generation of readers will also be flexible, making such applications as digital maps an attractive option, especially when connected to GPS hardware and software. Although e-paper readers like iRex’s iLiad, are already equipped with wireless Internet communication, they are not well suited as general-purpose Web-surfing devices. 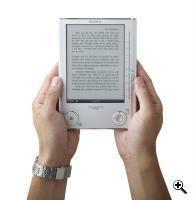 Electronic readers of the future will one day become the ultimate handheld devices. Having mentioned in this article a number of potential applications for e-paper, it is possible that the most important applications of this technology have not yet been invented. In the same way that Theodore H. Maiman did not foresee the DVD player when he invented the first laser in 1960, so might we still be in the dark as to the true potential of e-paper technologies. TFOT interviewed Nick Hampshire, an analyst at AFAICS Research, which focuses on publishing and media-related technology. Nick has been following the e-paper industry for many years, and his insights can shed light on both the current and future state of the industry. Q: Why do you think it took almost 30 years for e-paper to enter the market? A: The initial Gyricon technology proved expensive and had poor resolution; it was really only usable in the sort of message-board-display systems that were produced by Gyricon Media. 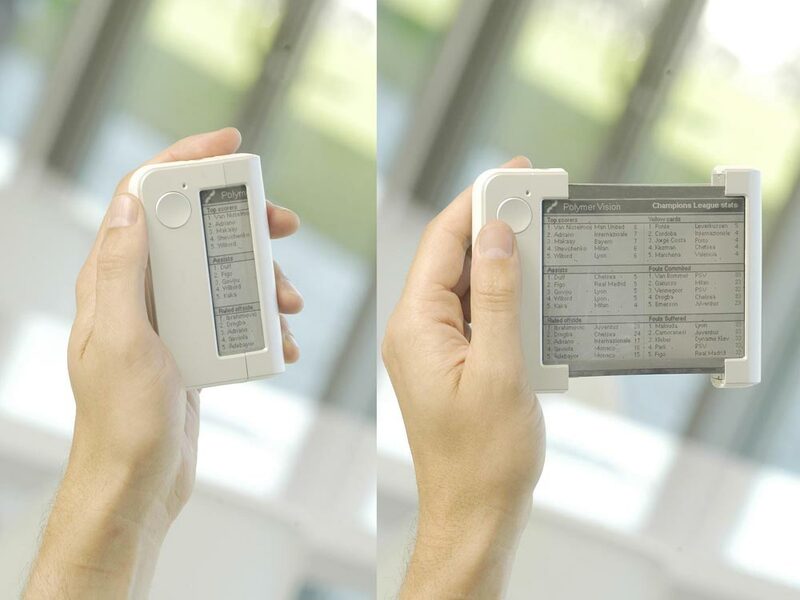 The development of true e-paper really only dates from about 1998, when E Ink first demonstrated their electrophoretic frontplane display technology; this gave a higher resolution and was potentially much cheaper. Since then, other companies, such as SiPix, have come out with electrophoretic display technologies. In the last four years, we have also seen companies like HP and Fujitsu bring out flexible displays that use cholesteric LCD technology. (Cholesteric refers to the phase of a liquid crystal in which the molecules are aligned in a specific manner. In Fujitsu’s case, for example, up to 50 percent of incident light in specific wavelengths and colors is reflected). E-paper has to be a cheap, reflective, low power, and preferably bendable, or have rollable display technology, and we are only just seeing the development of the technologies that can deliver this, namely an electrophoretic frontplane bonded to a flexible organic electronic backplane. These are the displays currently on the verge of being launched by Plastic Logic and Polymer Vision. Q: What are the current obstacles facing mass adoption of e-paper technology? A: The main obstacle is price. Our research shows that the cost of an e-paper-based reader has to fall to under $100 before a significant percentage of the population will buy one. Even then, they will only buy if suitable content is available at a reasonable cost. The second obstacle is availability of content. A: The technology of printed electronics will deliver low-cost production; we could be looking at give away e-paper display products by 2015. Content availability is a question of making sure that publishers are aware of the potential offered by e-paper displays, and prepared to make the investment to provide that content. Q: What do you think will be the “killer application” of e-paper? Q: When do you predict we will see the real e-paper revolution? A: It has already started but will become a real mass market in about 2012. Further discussion of electronic paper see this thread on the TFOT forums.